Richard Branson has intrigued me for years. Not for his knack for getting publicity but because he makes the world better. He cares. He enters established markets (e.g., music, airlines, mobile phones) and makes them more competitive. And more fun. I expected to see Branson live at the 2007 Real Estate and Wealth Expo (see lessons learned), alongside Tony Robbins and Donald Trump. We were duped (probably by the organizers). Branson appeared on screen from his island home in a presentation that looked prerecorded. Even so, he commanded our attention. Autobiographies let us learn from people we'll (likely) never meet. Losing My Virginity is hardly new. It was published in 1999 and runs chronologically. I listened to the audiobook, which Branson narrates. You can get a newer print edition if you prefer reading. Frankly, I didn't know much about Branson since I live a low noise life. I assumed he went smoothly from success to success, starting with Virgin Music. Hardly. He faced many obstacles and could have easily lost his businesses many times since the 1960s. When facing a hurdle, he usually made risky moves and won. I set about finding all these instruments: the acoustic guitar cost £35, the Spanish guitar £25, the Fender amplifier was £45, the mandolin £15, and the triangle was a bargain at £1. The tubular bells cost £20. £20 for tubular bells?? I said, "They'd better be worth it." They were. The record set records. The profits were reinvested, primarily in finding and supporting new recording artists. Public companies tend to focus on short term goals, which can hurt the long term prospects. Virgin went from private to public to raise capital. Then from public to private to act fast (no need for board approval) and experiment more (e.g., starting the Virgin Atlantic airline). Becoming private again still meant scrutiny. This time from banks. 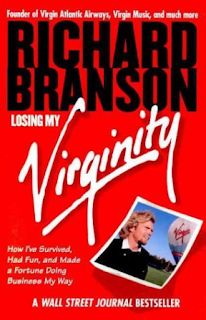 To grow, Virgin invested heavily and used borrowed money. This gave the banks influence over what Virgin could do and how long they could continue. Cash flow becomes very, very, very important. There are numerous examples of challenges with the banks. Virgin was not well understood by lenders or stock markets. While others may imitate, Richard Branson learned by experience and reflection. In his autobiography, he candidly shares what he went through. This leaves us richer --- though not quite billionaires. Richard Branson is one of my favorites. He is a business legend. He's inspirational, mate. Makes you feel like you can do anything.